Tales from the Riverbank is back, and PART 3 is bigger and better than ever before! 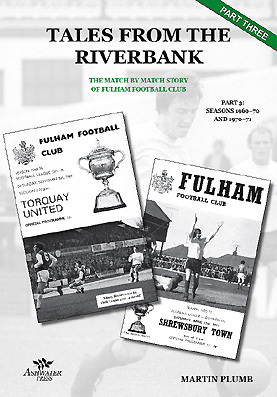 With over 125 photographs (many never seen before), this 224-page A4 hardback book is a breathtaking and detailed insight into two more turbulent seasons at Craven Cottage (1969-70 and 1970-71). It’s a time when Fulham start their climb back to respectability. The shock departure of Malcolm Macdonald / Fulham go crazy with eight goals at Halifax Town / Fulham score sixteen goals in just three league games / The Doncaster Rovers thugs come to town / Johnny Haynes gets the Fulham goalscoring record / The Luton Town floodlight failure / George Cohen’s testimonial match / The first round FA Cup knock out at Fourth Division Exeter City / George Cohen takes charge of the juniors / The Bristol Rovers leaflet protest / John Richardson scores one of the goals of the season in a rare Fulham TV appearance / Johnny Haynes’ final Fulham game / Fulham’s two wins in eighteen games, and morale at rock bottom / A great revival and Fulham push on to fifteen league games unbeaten / The Fulham youth, victorious in Düsseldorf / Jimmy Conway and Steve Earle head the league’s goalscoring charts / The departure of Johnny Haynes and the arrival of Jimmy Dunne / Barry Lloyd made captain at twenty-one / The Watney Cup thriller with Derby County / All five forwards score against Bradford City / Rodney Marsh’s first return to the Cottage and Rangers being rattled out of the League Cup / Cup specialists Swindon Town become Fulham’s next League Cup victims / Another fifteen game unbeaten run / Stan Brown’s testimonial match / Dad winning the FA Cup duel of the Dodgins / League Cup quarterfinal heartache at Ashton Gate / The Gillingham pantomime on ice / Three goals in eight minutes at Priestfield / The Fulham champagne promotion party at Bradford City / The Preston North End final letdown / Town Hall celebrations / The Riverside stand gets the go-ahead. Phew! That’s just the summary. We are committed to this series of books, and as long as supporters keep asking for them and ordering them in decent numbers, we’ll keep producing them. To confirm that promise, we would like to add that the text for Tales from the Riverbank Part 4 (1971-72 (Dodgin) and 1972-73 (Stock)) has already been completed, and the book is being put together now, and that Tales from the Riverbank Part 5 (1973-74 and 1974-75 (Stock)) is underway.